And now everything in detail! Causes of dermoid ovarian cyst. Symptoms of dermoid ovarian cyst. Treatment of dermoid cysts of the ovary. Dermoid cyst of the ovary (teratoma of the ovary) is one of the most interesting. It’s a treasure trove of various tissues. Many of my patients are surprised when they learn THAT it contained. Most often it is fatty tissue, hair, nails, cartilage, bones and more. However, all this is securely packaged in the capsule of the cyst. A dermoid cyst is a SAC filled with all sorts of fabrics. 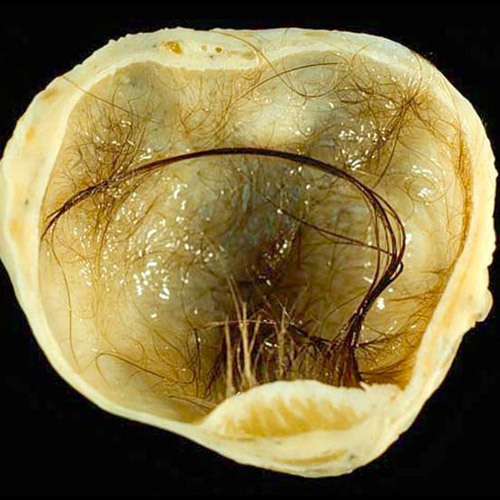 Sometimes, patients is rather difficult to imagine that in the depths of the ovary may be a head of hair or real bone. What is the reason of the unusual structure of a dermoid cyst? Causes of dermoid cysts are well known. The fact that its origin dermoid cyst obliged embryonic rudiment, which are obtained in the body tissue above. It’s called ectoderm (hence the name of the tumor). Such rudiments are available in almost all women in the ovarian tissue. But some, for unclear until medical science the causes of these microscopic germs begins to grow dermoid cyst. It grows slowly and completely invisible to women. Usually has a rounded (at small sizes) or oval-elongated shape. In the size of the dermoid cyst may reach 10-15 cm. 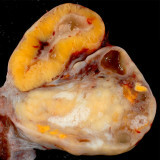 Although the most common tumor of 5-7 cm in diameter. 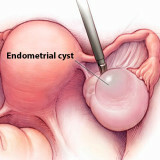 Sometimes, when first detected, a dermoid cyst can be confused with a cyst of a yellow body or endometrioid cyst. 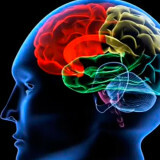 For a more accurate diagnosis MRI may be used. During the MRI adipose tissue becomes clearly visible that allows you to set the correct diagnosis. If you can not do an MRI, then a short follow-up (1-3 months) will help to eliminate cyst of a yellow body (it will disappear). When not complicated for you for a long time can not speculate about the presence of such a tumor. When a significant amount of begin to appear the firstsymptoms of dermoid cysts: nagging pain or discomfort in the abdomen, and that causes many women to start screening. Although regular examination by a gynecologist, especially with ultrasound monitoring, dermoid cysts are easily diagnosed early in their development. What is dermoid cyst dangerous? 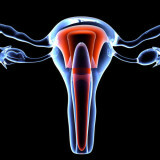 As it grows, the tumor displaces healthy ovarian tissue. In the beginning, ovary tolerates such a “roommate”. However, over time, normal blood flow is not altered ovarian tissue is hampered due to compression of the vessels by the tumor. 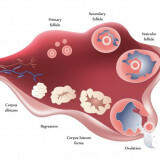 And the ovary begins to be replaced by connective (scar) tissue that is more resistant to lack of oxygen and nutrients. It happens completely unnoticed, because the second ovary fully celebrates with the increased workload. And, unfortunately, I regularly have to deal with the situation, when the operation for ovarian only a thin shred that spans across the dermoid cyst (see photo). Treatment of dermoid cysts may be the only surgical. Until science came up with a pill that would dissolve and completely “dissolve” the contents of the cyst. 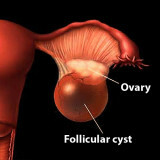 And produced than before the removal of a dermoid cyst, the more likely you are to save the ovary. Although in addition to time plays a big role, qualifications and experience of the surgeon. The cyst needs to be removed so that to preserve healthy ovarian tissue, but do not open the capsule of the cyst. Because of a spread between the gut fat hair may cause in the future rather unpleasant complications (up to the formation of intestinal abscesses). Given the fact that the dermoid cyst is most common at a young age, on the basis of foreign experience my technique was introduced by careful removal of the cyst. It differs from typical laparoscopy. The main task is to keep the maximum healthy tissue ovary and safely remove remote cyst.